Where does your business stand? Check your readiness for Industry 4.0! This self-check lets you calculate your very own Industry 4.0 scorecard. Find out where you are already well prepared for Industry 4.0 and where you still have room for improvement. The Readiness Model is the foundation for a self-assessment and comparison. The Online Self-Check developed for this purpose gives companies the ability to check their own Industry 4.0 readiness. 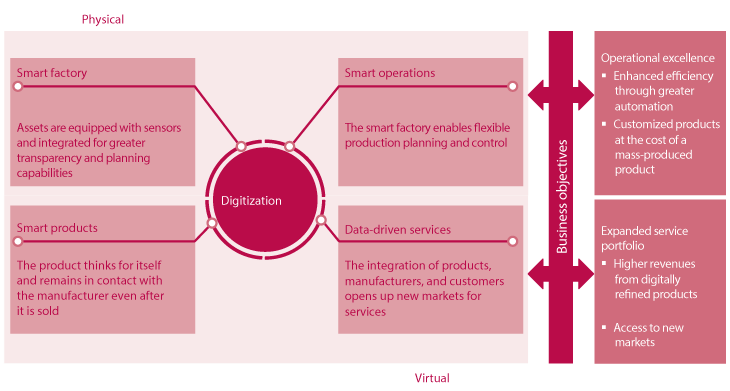 These six dimensions are used to develop a six-level model for measuring Industry 4.0 readiness. Each of the six readiness levels (0 to 5) includes minimum requirements that must be met in order to complete the level. Level 0 is the outsiders – those companies that have done nothing or very little to plan or implement Industry 4.0 activities. Level 5 describes the top performers – those companies that have successfully implemented all Industry 4.0 activities. This “Industry 4.0 Readiness” study was commissioned by the IMPULS Foundation of the German Engineering Federation (VDMA) and conducted by IW Consult (a subsidiary of the Cologne Institute for Economic Research) and the Institute for Industrial Management (FIR) at RWTH Aachen University. VDMA experts and some industry representatives served in an advisory capacity in the development of the study. 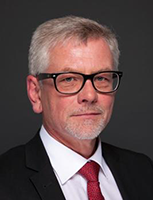 The IMPULS Foundation of the German Engineering Federation (VDMA) explores fundamental issues of strategic importance to the German engineering industry. The IMPULS Foundation was founded in 1989. Since then, it has commissioned over 90 studies and special projects covering a broad spectrum of topics – from corporate governance and economic policy to technology, innovation, and education. IW Consult – aligned with a powerful industry association as the consulting arm of the Cologne Institute for Economic Research – provides commissioned research and highly specialized research services for businesses, associations, government ministries, foundations, and public institutions. At the interface between theory and practice, IW Consult develops custom end-to-end solutions to address important economic and social policy issues. 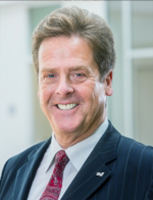 FIR is a non-profit, cross-industry research institution at RWTH Aachen University active in the field of business organization and corporate development. The institute works to systematically develop organizational solutions around business transformation, service management, information management, and production management for the companies of tomorrow and works with industry partners to ensure best-practice implementations. Successful implementation of Industry 4.0 enables distributed, highly automated production. Unlike in traditional production, smart workpieces will control and monitor the production process and, in the final expansion phase, guide themselves autonomously through production. This happens in the environment of the smart factory. The smart factory is a production environment in which the production systems and logistics systems largely organize themselves without human intervention. The smart factory relies on cyber-physical systems (CPS), which link the physical and virtual worlds by communicating through an IT infrastructure, the Internet of Things. Industry 4.0 also involves digital modeling through the smart gathering, storage, and processing of data. In this way, the smart factory concept ensures that information is delivered and resources are used more efficiently. This requires the real-time, cross-enterprise collaboration between production systems, information systems, and people. These integrated systems produce huge amounts of data that are processed, analyzed, and integrated into decision-making models. One hallmark of Industry 4.0 is the enterprise-wide and cross-enterprise integration of the physical and virtual worlds. The advent of digitization and the plethora of data it has brought to production and logistics have made it possible to introduce what are in some cases entirely new forms and approaches to production planning systems (PPS) and supply chain management (SCM). The technical requirements in production and production planning necessary to realize the self-controlling workpiece are known as smart operations. Smart products are a vital component of a unified “smart factory” concept facilitating automated, flexible, efficient production. Physical products are equipped with ICT components (sensors, RFID, communications interface, etc.) to collect data on their environment and their own status. Only when products gather data, know their way through production, and communicate with the higher-level systems can production processes be improved and guided autonomously and in real time. It also becomes possible to monitor and optimize the status of the individual products. This has potential applications beyond production alone. Using smart products during the usage phase makes new services possible in the first place – through communications between customers and manufacturers, for example. Readiness in the area of smart products is determined by looking at the ICT add-on functionalities of products and the extent to which data from the usage phase is analyzed. The objective of data-driven services is to align future business models and enhance the benefit to the customer. The after-sales and services business will be based more and more on the evaluation and analysis of collected data and rely on enterprise-wide integration. The physical products themselves must be equipped with physical IT so they can send, receive, or process the information needed for the operational processes. This means they have a physical and digital component, which in turn are the basis for digitized services in the usage phase of the products. Employees help companies realize their digital transformation and are the ones most affected by the changes of the digital workplace. Their direct working environment is altered, requiring them to acquire new skills and qualifications. This makes it more and more critical that companies prepare their employees for these changes through appropriate training and continuing education. Readiness in the dimension of employees is determined by analyzing employees skills in various areas and the company’s efforts to acquire new skill sets. Note on liability: Although we have made every effort to check the content of this site, we assume no liability for the content of external links. The operators of linked sites are solely responsible for their content. The Online Self-Check may be used free of charge. None of your personal data is collected during the Online Self-Check. The information you provide is stored on the servers of IW Consult GmbH and used solely for statistical purposes. None of your data is shared with third parties. This website uses the web analytics platform Piwik to analyze website hits.